It happens every year—like Groundhog’s Day—and I have the same déjà vu annually! 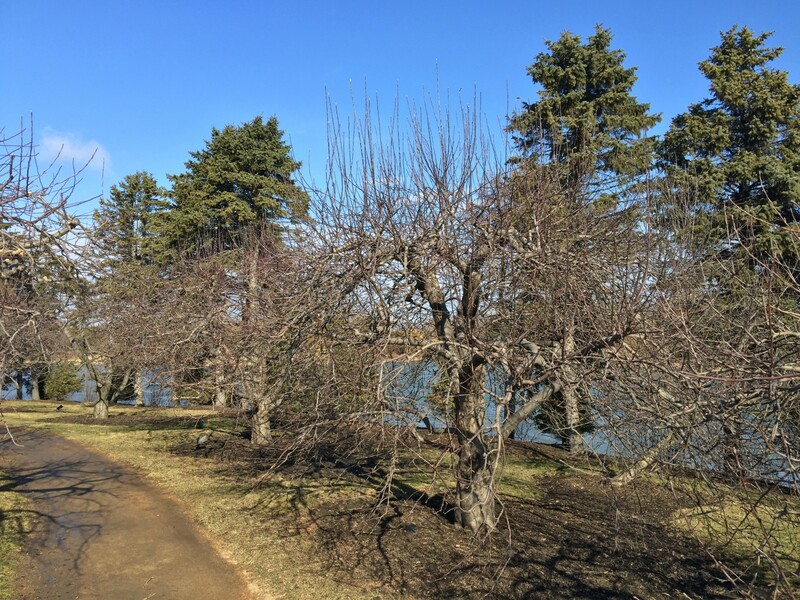 Each winter for the past 20-plus years, I have supervised and worked on the pruning of the apple orchard at the Regenstein Fruit & Vegetable Garden. Since pruning has such a great effect on an apple tree’s health, it became an annual duty of the Plant Health Care Department (that I manage) many years ago. Tom Tiddens and Tom Fritz pruning the apple orchard. Cutting in the right location ensures speedy healing, and a good shape when finished. To prune the north orchard (about 43 trees) it takes three people about two weeks. We wait until late winter/early March to begin pruning and complete the work before the buds begin to plump and open, as this is the optimal window to prune apple trees for plant health. Over the years I have been in every tree many, many times. Some are easier to prune than others, and some are downright intimidating. The one tree that is the most difficult to prune has been named “The Spirit Breaker,” and we always draw straws to see who gets to prune that one—it takes a full day! Overall, I very much enjoy this late winter pruning project, as it has become an annual rite of passage into spring for me. 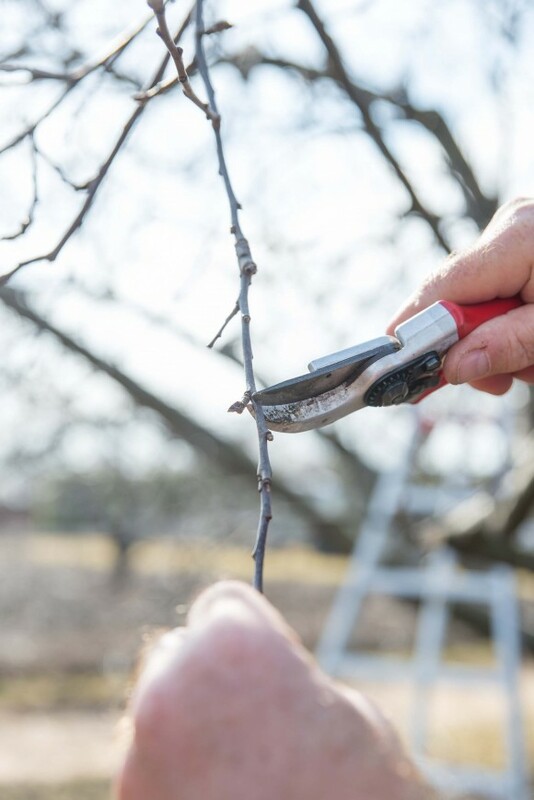 Our current style of pruning strikes a balance between ornamental pruning and conventional orchard pruning, which focuses more on production (and which can be very aggressive) and less on plant health. 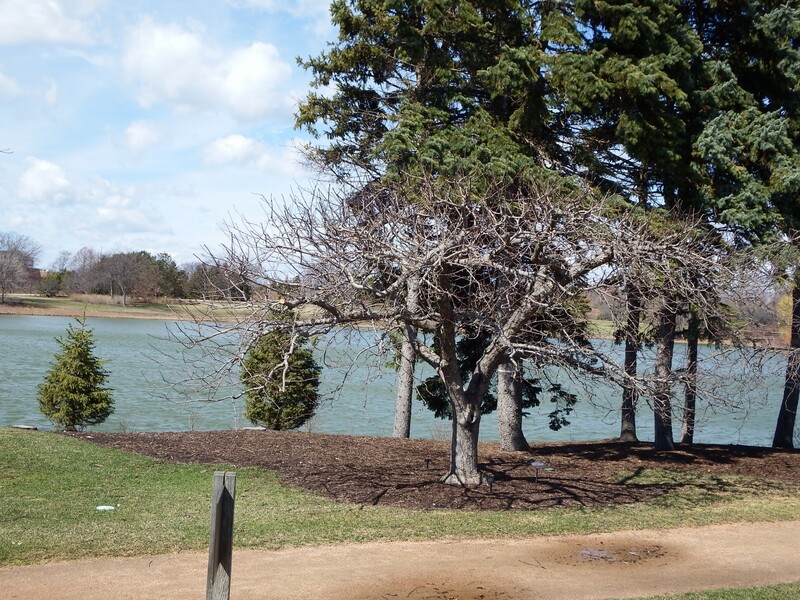 The difference is that every cut we make is carefully made by hand back to a branch or bud, without violating the basic ornamental pruning rules. These carefully made cuts allow for healing without the dieback that can promote disease and other problems. We also work on developing proper branch angles, and thin the tree for better light penetration; another goal is to keep the height down. When pruning is complete, our orchard from a distance looks similar to conventional orchard pruning, where the older trees are kept low, but when you look closely, you can see the difference. Why is it so important to prune an apple tree annually as we do to our apple orchard? Proper annual pruning will increase harvest quality. Pruning lessens diseases such as apple scab, fire blight, and leaf spot. It increases air circulation and allows the tree to dry out more quickly; moisture promotes disease. Pruning regulates the height of the trees for easier harvesting. Pruning allows for better light penetration for more—and higher quality—fruit. Pruning allows for branch directional training that will increase production and lessen apple weight-load breakage in late summer. 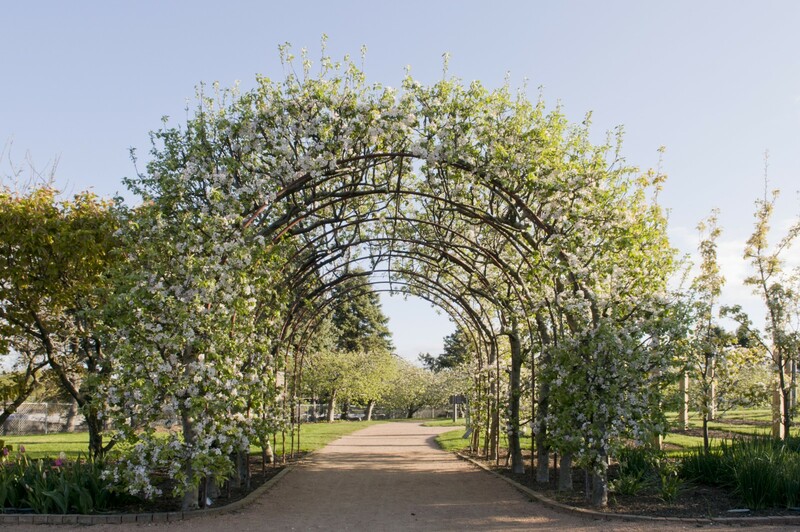 The apple arbor in bloom, April 2012. New whipstock was planted on half the arbor a few years ago, and the new trees should soon look this good again. As for me, I am closing this year’s book on “time to prune the orchard;” 2016’s orchard prune is complete! 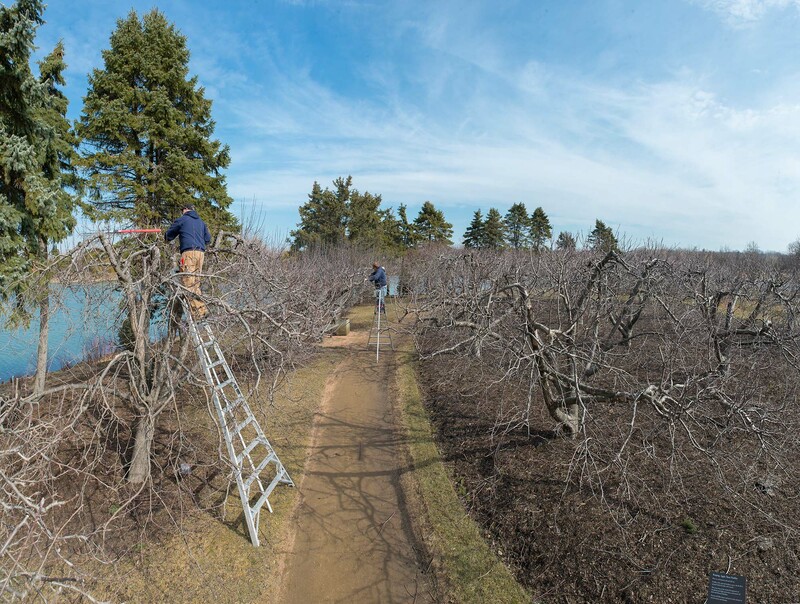 Special thanks to Thomas Fritz and Chris Beiser (plant health care specialists and certified arborists) who worked diligently to get the orchard prune completed this year. Thanks for sharing this. I had never considered how pruning could be used to affect the production capabilities of fruit-bearing trees, but it makes so much sense. Not only that, but using pruning to prevent too much weight from pulling a branch down sounds like a great way to deal with that particular issue.